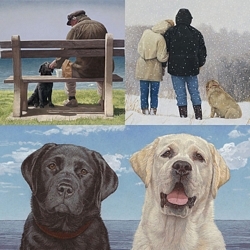 Image Size: 21"w x 16"h.
Dogs are man’s best friend but dogs’ best friend may be John Weiss, who has immortalized them with artistry and sensitivity in Greenwich Workshop Fine Art Editions for nearly thirty years. The Anniversary Edition "No Swimming Lessons Today" features one of Weiss’ beloved breeds and most popular. Nearly all his Lab editions are in low inventory or Sold Out at Publisher. Indulge your love of Labs and motherhood with this classic John Weiss Anniversary Edition of Labrador retrievers waiting out Mother Nature.